Who Made the Best Deal for a Striker? So far three of the big Premier League clubs have splashed out the big bucks for strikers with Arsenal, Liverpool, and Chelsea all looking to boost their forward attacking lines. Liverpool has already gone after two strikers in their attempt to replace the prolific scoring abilities of Luis Suarez and they already have Daniel Sturridge for either one to play alongside. Arsenal also have other attacking options particularly with Olivier Giroud. Chelsea could be the one team that has been desperate to add an out and out striker with Fernando Torres, Demba Ba, and Samuel Eto’o all putting in disappointing performances last season. It also still remains to be seen whether Romelu Lukaku will be with Chelsea for the 2014-15 Premier League season. So far Arsenal has spent the most on their newest striking option by putting up $59.4M (£35M, €44M) for Alexis Sanchez from Barcelona. Chelsea spent $54M (£32M, €40M) on Diego Costa from Atletico Madrid while Liverpool splashed out $14.5M (£8.5M, €10.7M) on Loic Remy from QPR and another $6.8M (£4M, €5M) for Rickie Lambert from Southampton. So which team got the best deal for their striker? This question really depends a lot on what each team expects from their striker along with what that player can add to the team, however, a breakdown of the stats from last season can give us a clue as to what each player can bring to their respective team. In looking at these four strikers there are some distinctions that do standout, most of which has to do with their roles within their previous teams. Rickie Lambert played in the most games at 37 while Diego Costa played the most minutes with 2957 over 35 games. Lambert played 2816 minutes while Sanchez played 2377 over 34 games and Remy put in 2097 minutes in 26 games. Costa had the most goals with 27 followed by Sanchez at 19, Remy with 14, and Lambert put in 13. Still, there is more to a striker than simply scoring goals. There is not a whole lot to separate them in terms of shooting accuracy with Sanchez at 59%, Costa with 57%, 51% for Lambert, and 49% for Remy. Where their roles begin to truly show are in the number of assists provided. Lambert and Sanchez each provided 10 assists with Costa and Remy both with 3 apiece. All four players also have the ability to create chances for teammates. Rickie Lambert leads the four in this category having created 53 chances as well as providing 43 key passes. Diego Costa had 45 chances created with 42 key passes while Alexis Sanchez created 47 chances along with 37 key passes. Loic Remy was at the bottom of this with 30 created chances and 27 key passes, however, he also played the fewest games and fewest minutes. The last thing to look at in all of this is what they can each add to their team defensively. Alexis Sanchez comes out on top here with 39 tackles compared to Diego Costa’s 15, Lambert’s 9, and Remy’s 8. This is most likely due to Sanchez’s use at Barcelona where everyone in the team is expected to track back and press all match long. As you can see there aren’t a whole lot of differences, but Sanchez’s stats do show that he was a player that really did well within the Barcelona system. The same could also be said of Costa and Lambert, both of whom were involved in the build-up of play and in setting up their teammates. Loic Remy, on the other hand, was used more as a player expected to score goals and did not do as much to create for his teammates. Liverpool will already need to make changes to their formations following the loss of Luis Suarez, so fitting Remy or Lambert into any setup could work out quite well for them. Again, the question of how great a deal each striker is for their respective team will rely heavily on how they actually fit into the squad. From looking at the statistics it does seem that Alexis Sanchez will provide the most impact for his team. In my opinion Rickie Lambert has been the best deal for a striker this summer so far. In fact, I think the dual purchase of Loic Remy and Rickie Lambert by Liverpool was the best deal for forward players considering their price. However, that doesn’t mean that they will end up carrying this Liverpool team in the same way that Sanchez and Costa could do for Arsenal and Chelsea. Liverpool paying $21M for two strikers does seem to be a better deal considering their expenses compared to Arsenal’s nearly $60M and Chelsea’s $54M. It all remains to be seen as to how much of an impact each of these players will bring to their teams. It is also quite possible that there is yet another player that is a better deal for their team not to mention that Chelsea picking up Cesc Fabregas and Liverpool picking up Adam Lallana may be better deals than the strikers. What do you think? Which team has gotten the best deal or is there another player you would add? 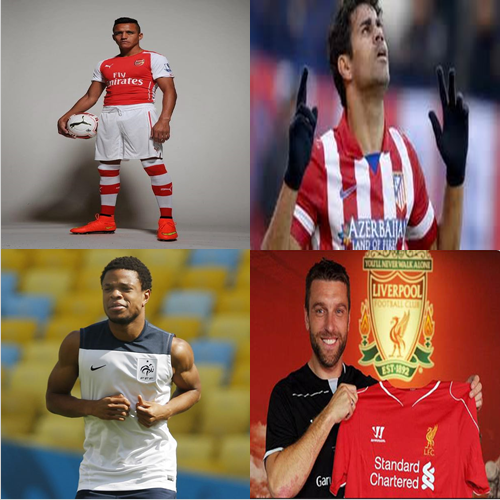 Home » Premier League Perspectives » Who Made the Best Deal for a Striker?